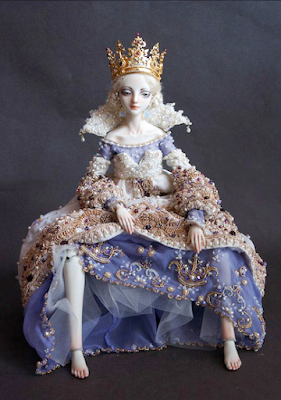 Following a tip off from blog Yellowgoat I found these amazingly beautiful, dolls called "Enchanted Doll". They are posable and ball jointed but made of porcelain and polymer Clay. The girl who makes them is Marina Bychkova, a Russian born artist who trained in Canada. She says that her dolls are unique because she refuses to look at other dolls for inspiration. Instead she looks to the world of fairy tales. What interests her most is the 'implicit and often explicit violence that lies just beneath the surface of the magic'. Here are a few of her costumed dolls. If only the makers of Barbie had such imagination. Just imagine what your childhood games would be like. 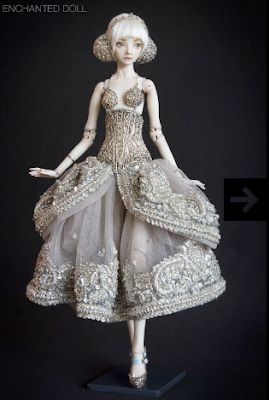 One of the dolls was recently auctioned off on ebay. Guess how much she made.....$40,000.00 US dollars!